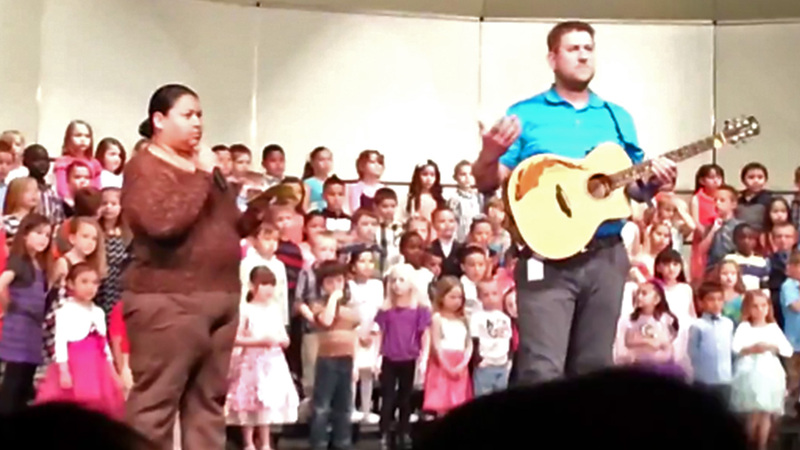 PERRY, Iowa -- While attending an kindergarten class' spring concert, a man stood up and began shouting "English only, U.S.A." as an interpreter began translating for Spanish-speaking parents. The video uploaded to YouTube on April 23 shows the unidentified man in the audience disrupting the children's concert at the Perry Performing Arts Center, according to The Des Moines Register. The interpreter immediately froze in shock at the man's display, and audience members booed as he continued to chant. The man continued to chant even as school staff escorted him out of the auditorium. Police said they were made aware of the incident and that no arrests have been made, though the incident is still under investigation. The school's superintendent M. Lynn Ubben wrote an email to staff, thanking them for a "quick and appropriate response to an unfortunate disruption." "We live in a diverse/people rich community that values all people and our children truly are our most precious resource," Ubben wrote, according to the Register. "As our elementary music instructor so eloquently said, 'Our children don't see color, they just see their friends.'" The Register reported that the children's class was comprised of roughly 50 percent Hispanic/Latino in the 2013-2014 school year. In the 1990s, many Latino immigrants moved to Perry to work at a meatpacking plant, reportedly leading to extreme racial tensions in Iowa town. At the time, roughly 1 percent of the town's population was Latino, though within 10 years that number rose to 25 percent.